Obesity rates in pets continue to rise, and according to the Association for Pet Obesity Prevention, around 53 percent of dogs are overweight or obese. More surprisingly, 90 percent of owners don’t even know that their beloved furry friend is overweight. That means there is nearly a 50% chance that your dog needs to lose weight, but you think they are healthy. The good news is pet weight loss is a lot easier than losing pounds yourself. Imagine if someone could magically limit your portions and remove all the “bad” food out of your diet. Well, you can do that for your dog, and no, we promise, they won’t be starving. But they will live a healthier and longer life. Here are some easy ways to help your dog shed pounds. Most of us think we’re serving our dogs the appropriate portion of food. Yet if over 50% of dogs are overweight or obese, we’re not. Read the label and find your dog’s IDEAL weight. Then measure your dog’s food based on that. If you have a super active dog that runs with you every morning or hikes with pals during the day, you can add a bit more depending on weight and activity. If you are unsure, ask your vet. They can run a simple calorie calculation or if you know your dog’s ideal weight, you can do it online. Most dogs inhale their food. By making feeding fun, you are slowing them down and aiding digestion. Feed their food in a puzzle toy or slow feeder like a Kong Wobbler or Fun Feeder. This will also keep them distracted while you eat your dinner and stop them from begging. This might seem like a no-brainer, but we can all cave in to those adorable puppy eyes. It happens to the best of us. If you do indulge your dog with extra “love” make sure to reduce your dog’s regular meal portion later. Better yet, use kibble or veggies as treats. If your dog doesn’t like his kibble or regular food, then you may want to switch it up. Snack-able fruits and veggies dogs love include cooked green beans, carrots (raw or cooked), and pears. Our houses can get busy and sometimes family members can inadvertently double, triple feed their dog. 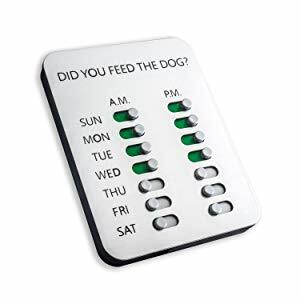 It’s important to communicate how much and when your dog eats. We suggest leaving a sticky note, sending a text, or writing it on your family board. Whatever works for your family. And be warned, even if your dog has been fed by one human, they may try to swindle the others by acting hungry. Don’t believe your dog. Ask a human first if they have been fed or not. Dogs need lots of exercise and going down the block to potty does not count. Find ways to incorporate exercise into your dog’s daily schedule. That can include playing fetch inside, going to the dog park, or taking a jog around the block. If you don’t have time during the week to exercise your dog, sign them up for hikes or sports classes instead. Has your dog undergone a weight loss journey? Let us know in the comments!